No pull request necessary. Nez purposely does not enable the depth buffer because it does the sorting itself. The Material system is there so that you can then do whatever you want with your Materials. Likewise, Renderers are all overridable so that you can render exactly how you want to if you choose to not use Nez's sorting. I just started tinkering with Nez and I like what it has to offer. Unfortunately I'm having a problem getting it working in an Android project and I was hoping I could get a push in the right direction. Results are the same when referencing the .dll directly. Anyone experienced something like this? After digging into this for much of the morning, I've narrowed it down to being present when using TiledMapMover. Using a regular mover results in super smooth camera movement, using the TiledMapMover is very jerky. I see a commit to TiledMapMover a few days ago that was to address adding subpixel movement, but it was reverted a few days later.. not sure what that's about. I've been unable to narrow down the problem further, or fix it... I'm giving up for now and hoping someone else can at least chime with with ideas. Just wondering... Is Nez considered "completed"? The core of Nez is fairly complete. I don't think it will ever be 100% complete, but at this point it's pretty solid and very flexible. For example: out of the box, the renderer can be used in standard forward rendering, deferred rendering, multi-render target blends and pretty much anything else you would want to do. This was all added with no changes to Nez code. As for Components to build on the framework itself, there are always more that can be added. Anything that is not game-specific for example would be a good candidate. Most Components are usually game-specific though so they wouldn't work as building blocks in the engine proper. For anyone interested, Nez now has a dedicated Discord channel. It'd be awesome to get some participation there to discuss the framework in detail, cover different implementations and problem solutions, show off work, help each other work through problems and discover some of the more "hidden" features and maybe discuss how we as a community might able to help contribute to the project. Hello, could someone help me fix this problem I posted here ? Hello, can XMLTemplateMaker write the data to the xml file? It does exactly the opposite: it reads the XML into a strongly typed object at runtime. In other words, I can't use it to save the runtime data. If so, how do I save the data to xml using nez. The same way you would any C# program: use any of the various XML classes in the .NET framework or a third party XML lib. Hello, I have a problem about Nez.UI. I create a entity as my player and I add the CameraFollow to the player.The problem is that when my player moved and the camera followed,but Nez.ui is not working.For example, button.onclick is not working. I got it. 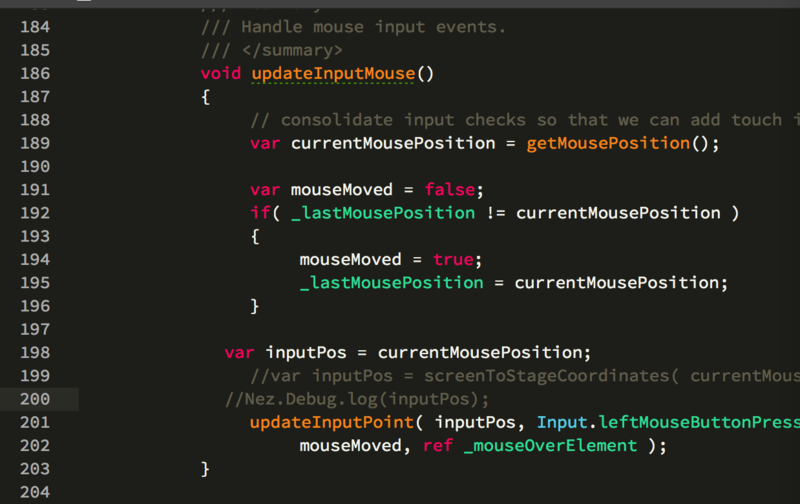 I change the inputpos.The button is working.But I don't know that if so, are there other bug about nez.ui.